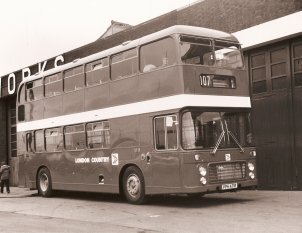 JON700E was notable even before it was delivered in being the very first RELH4 chassis (RELH4/101). 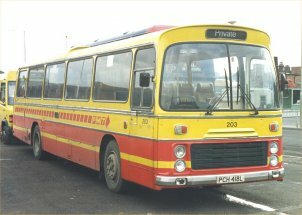 It was also the very first RE delivered to an independent operator and was one of only three built with Plaxton Panorama bodywork. 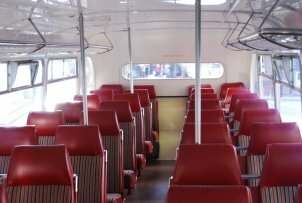 It was delivered to Flight's Coaches of Birmingham - it turned out to be somewhat unreliable, the air suspension giving them some trouble - and remained the only RE in their fleet. 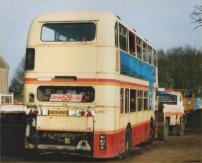 Seen here at Epsom in 1980, captured by the prolific camera of Frans Angevaare, it is now in the hands of Alpine of Chadwell Heath where it remained until destroyed by fire in an arson attack in late 1983, just failing to survive long enough to stand a decent chance of being saved for posterity. 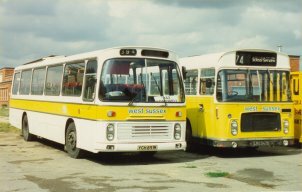 Some 20 years ago West Sussex County Council ran a fleet of REs and VRs on some of their non-commercial routes rather than tendering them out to other operators. 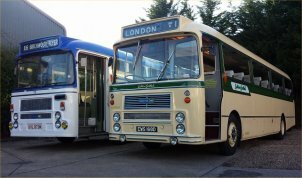 On researching the fleet I was surprised to discover that they owned no fewer than 19 very varied REs (RELLs, RELHs with both bus and coach shell bodies and a RESL) as well as four VRs. 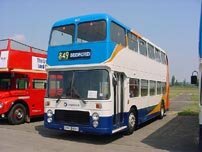 Representing the ECW coach body in this view is YCH891M while the bus-bodied RELL is LRC347K. 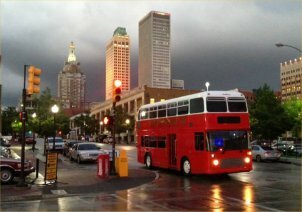 The photo is from Paul Green's excellent Flickr site. 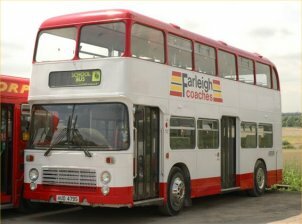 Dreadnought Coaches of Alnwick have just repainted their RELL6L former Colchester Borough Corporation 24 (SWC24K) in fleet colours to join their excellent fleet of Lodekkas and other classic vehicles. 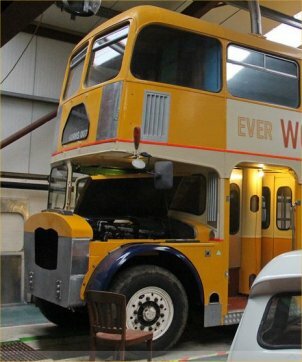 Many thanks to Phil Logie for this view, the first to reach me. 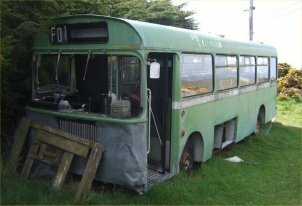 I am always delighted to hear from fellow preservationists about the progress (or indeed lack of progress) on their VRs. 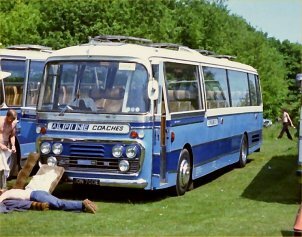 Dave Clements bought this ultra-lowheight coach-seated ex-City of Oxford Series 2 (NUD105L) around the same time as I bought my own VR and their restorations progressed at about the same speed for the first decade! 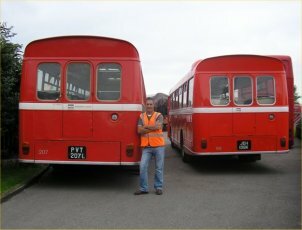 Dave has recently completed the major mechanical work and washed off ten years of accumulated grime from the bodywork. 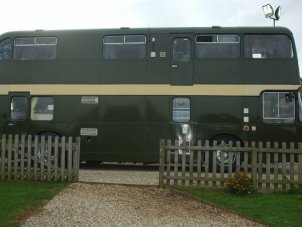 The result is a tidy bus which drives nicely around the yard. 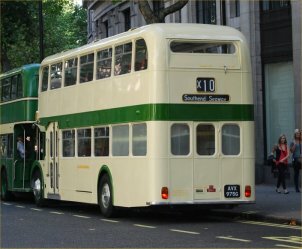 It will be a pleasure to see this rare example back on the road in due course. 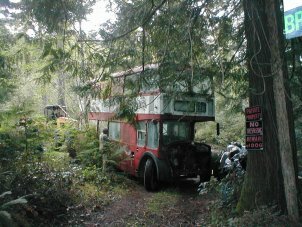 This photo is a celebration of survival. 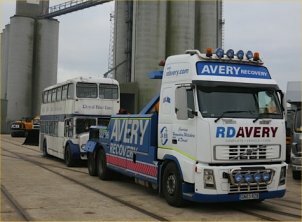 Last night, at their storage depot in Dorset, James Pratt's VR 1215 (LFJ862W) and Terry Bennett's 1159 (AFJ766T) had a lucky escape when they were driven out of a fire, stared by arsonists, which would surely have destroyed them and two other vehicles had it not been for the swift action of the fire brigade. 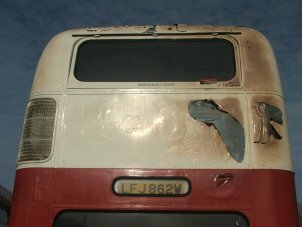 1159 was undamaged, whilst 1215 has superficial damage to its paintwork as shown and will hopefully be out and about again this summer. 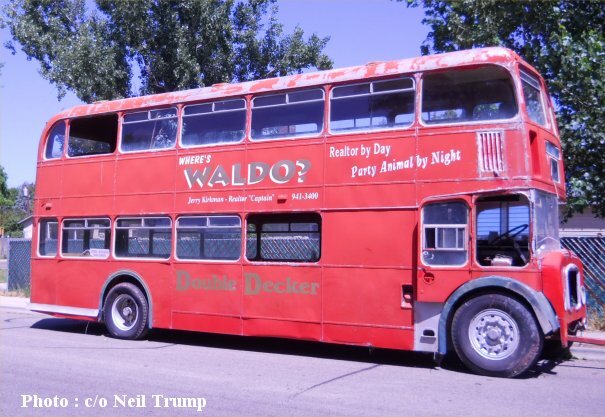 Thanks to Robin Woodcock for supplying the photo. 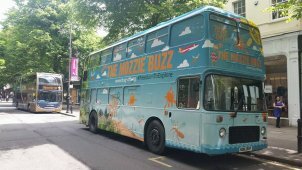 Regular viewers will be well aware that there is great excitement on this website that Doctor Who is to star in a Bristol VR in the Easter Special episode "Planet of the Dead" in which the VR will play a starring role. 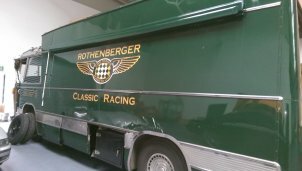 The first VR shipped out to Dubai was RUA461W and was severely damaged in transit as can be seen. 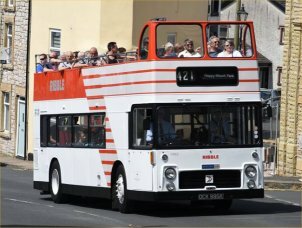 GGM84W is now on its way out there as RUA's replacement - I hope they take more care of this one! 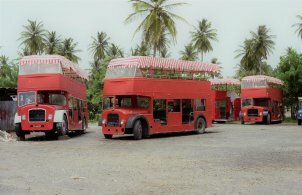 Followers of my News page will know that reports of Lodekkas arrive regularly from around the World. 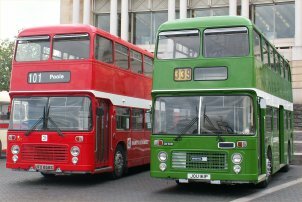 These are usually individual vehicles, but this week Andy McClelland spotted two FLFs running a private hire for Royal London Bus (because of course they all came from London!) 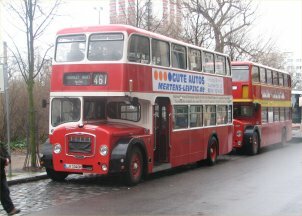 in Leipzig, Germany. 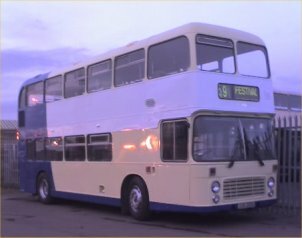 At the front (showing its UK number on its destination) is former Eastern Counties FLF461 (KAH461D) while behind is one-time Cheltenham District (hence my excitement!) 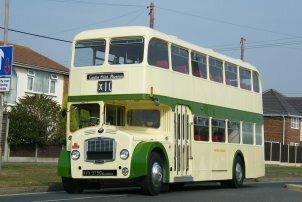 7221 (EHT110C). 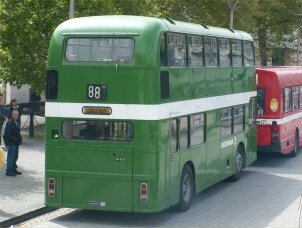 I make no apology for making this month's photo one of my own VR, JOU161P which has just emerged from a two-month visit to Busworks at Blackpool in its original livery of NBC green with Cheltenham fleetnames. 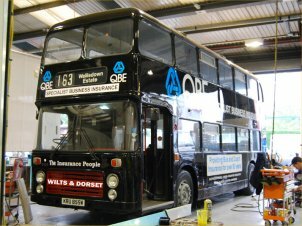 Many other jobs were also undertaken at the same time, including new window rubbers and the rectification of a major chassis fault. 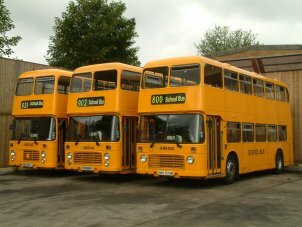 The day after the drive down from Blackpool 5031 attended the Bristol Centenary rally where it is seen lined up next to another pristine VR, UFX858S which carries Hants & Dorset NBC red livery. 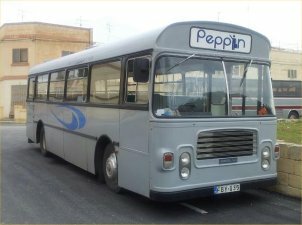 Many thanks to Peter Cook for the photo. 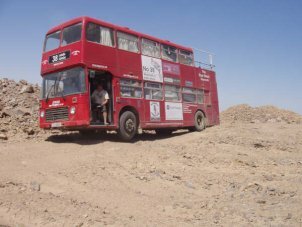 Possibly the most ambitious use of a VR ever is the tour being undertaken by Daniel Spokes and Matt Lumber overland to India, China and back via Russia. 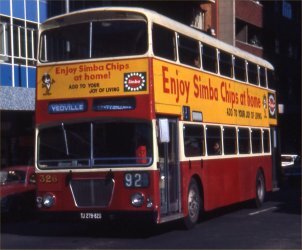 The VR being used for this mammoth journey is former Bristol Omnibus 5534 (EWS742W). 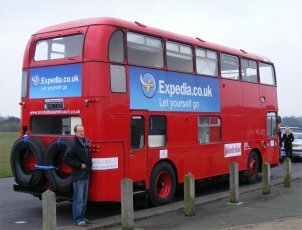 A very interesting photo montage/commentary is available at http://www.guardian.co.uk/travel/2008/apr/13/roadtrips.adventure whilst the pair's progress can be followed at http://letyourselfgo.expedia.co.uk/doubledecker/. 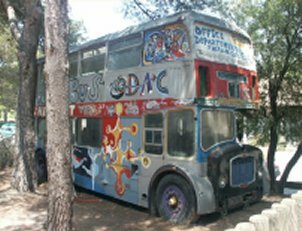 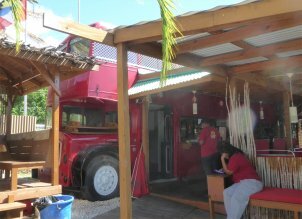 There is also a site describing how the dream came to become reality at http://doubledeckeradventure.com/index.php. 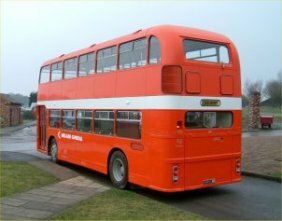 Very many thanks go to Allan Macfarlane for providing this rear view taken at the very start of the tour on April 20th at the Downs in Bristol. 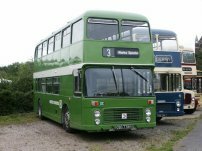 Very pleasing to record is that Abus have repainted one of their two remaining serviceable VRs in a special livery to celebrate the centenary of Bristol Commercial Vehicles. 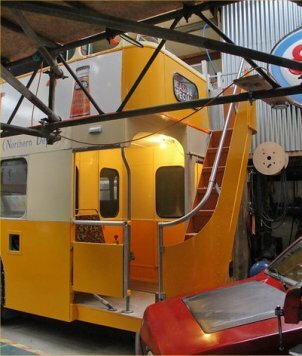 The VR in question is XHK221X and I am indebted to Mike Smith for snapping it on his mobile phone as it emerged from the paintshops today. 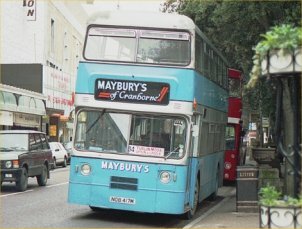 I thought that the blue area was to recall the blue livery carried for decades by Bristol Tramways vehicles, but Allan Macfarlane informs me that it is in deference to the first three Abus vehicles which were all blue liveried. 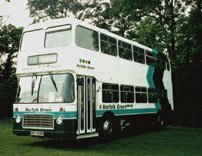 Several events are planned to celebrate the BCV Centenary this year, and I intend to be at the Bristol Harbourside Rally on May 18th with my own VR (JOU161P) - I look forward to seeing lots of readers there. 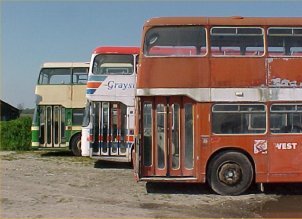 One of the most amazing and enjoyable aspects of maintaining this website is the sheer variety of locations I hear from where Bristol vehicles have migrated after finishing service in the UK. 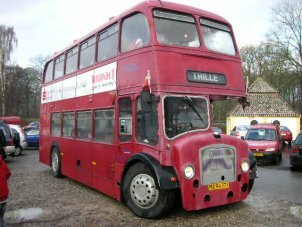 Quite literally every corner of the World houses a Bristol of some type or other. 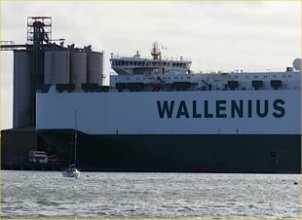 In recent months I have heard of Lodekkas in Argentina, Alaska and Russia, LHs in the Caribbean, REs in New Zealand and VRs on Hawaii and in South Africa. 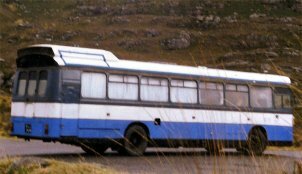 It should come as no surprise then to hear that Glyn Bowen has today sent this photo (taken by Liz Penrose last month) of former Crosville LH6L SLL617 (MCA617P) which was exported to the Falkland Islands back in 1992. 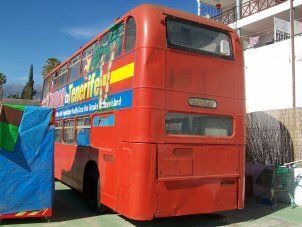 It was used to transport tourists to a penguin colony, although it has clearly not run for some time. 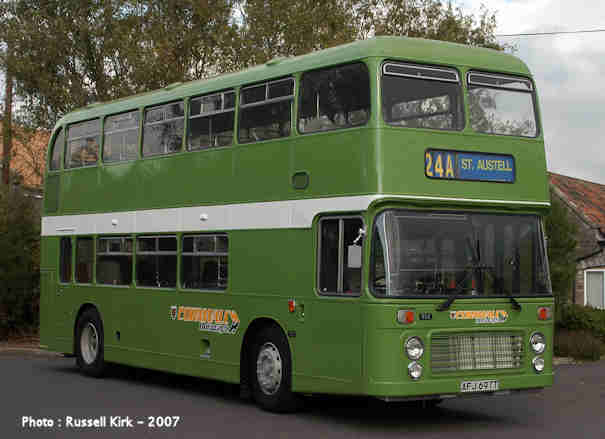 It retains Crosville NBC green livery and still partially shows that fleetname on the cove panels. 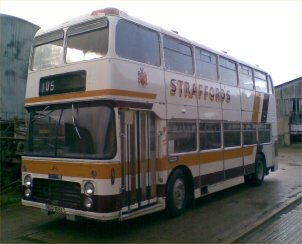 Apparently it was transported to the island by helicopter - presumably from the ship that carried it to the southern Atlantic and not from Middlewich where it was supplied by dealer Martins! 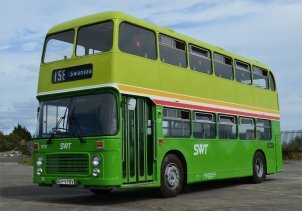 This is former Western National 1132 (AFJ697T) which has just been superbly restored with Cornwall Busways fleetnames on NBC green livery. 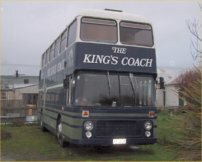 It is owned by Matt Powell and the Kirk brothers (Russell & Nigel). 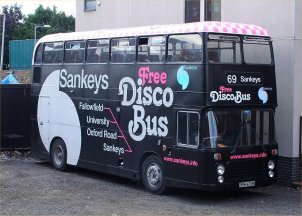 I am very pleased that, after a chance meeting in Bristol recently, the Kirks have agreed to share their extensive records to improve accuracy on this website and that can only be good news for readers - I would like to extend my sincere thanks to them for this. 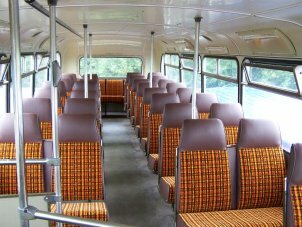 1132 is a very welcome addition to the ranks of restored preserved VRs, and detailed touches like the blue background on the destination linens really do add to the authenticity. 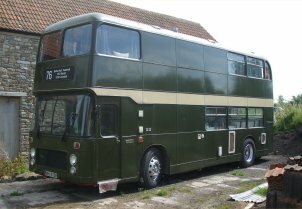 I have noticed a trend recently whereby the number of VRs in preservation has thinned out slightly - inevitably some are being scrapped, some have re-entered operational service, but also a good number are thankfully being fully restored like 1132. 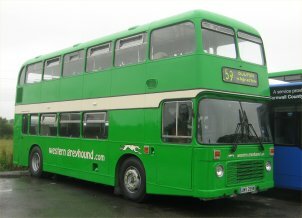 Fred Lawrance kindly sent me this photo of his recently-repainted former Eastern National LH 1103 (UVX7S). 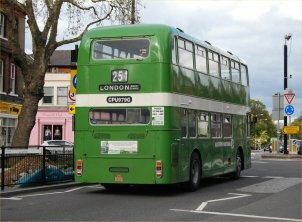 Fred is well aware that the colour scheme is non-authentic, but in his own words he has an "affliction" for NBC livery and believes the LH looks good in these colours - I most certainly would not disagree with him - it would have been wonderful to see fleets of NBC LHs running in such a scheme rather than the unrelieved bland green livery many of them carried in their latter years. 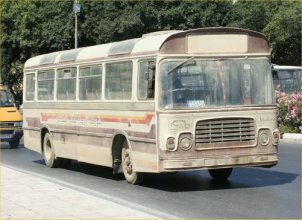 This is the last survivor of the long-lasting quartet of vehicles, UVX4S, UVX5S and UVX6S all having been scrapped in recent years. 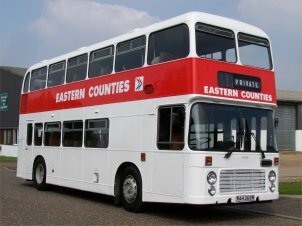 If anyone has views of any of these in service with Eastern National I'd be pleased to see them. 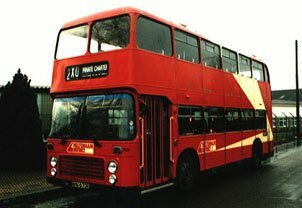 The PPH-R batch of VRs (the only ones that were new to London Country) are a particular favourite of mine, and it is great to see the last one numerically (PPH475R) still in use. 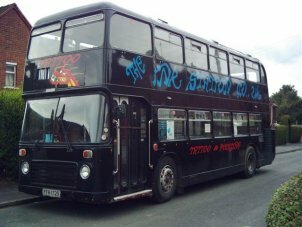 This photo was taken by Ian Roberts during an afternoon stroll on July 30th and shows that this VR, even as it passes its thirtieth birthday, is in use on a free nightclub service in Manchester - strong echos of the use of my own VR in a black livery on a nightclub service in Derby back in the 1990s. 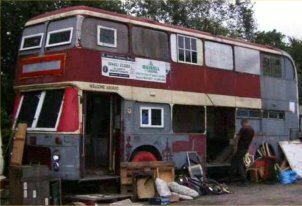 I hope one day this one might enter the preservation ranks, meantime I wonder if the revellers of Manchester appreciate their transport on a Saturday night/Sunday morning? 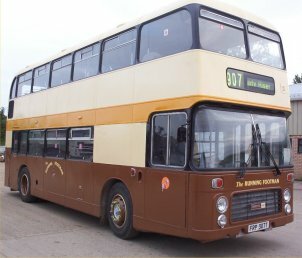 KRM431W (now reregistered PHH149W) found fame as the last surviving VR with Stagecoach North West (Ribble/Cumberland), even receiving Stagecoach "rolling ball" livery, from which it has now been repainted into Cumberland's post-deregulation livery having passed into preservation last October. 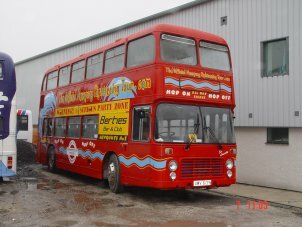 It is a credit to new owners Brian Pritchard and John Burrow (the latter having performed the repaint himself). 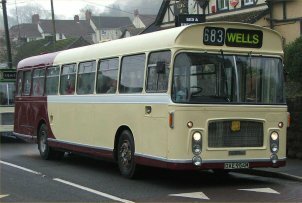 Abus of Bristol have owned REs on and off throughout their existence, even in the earlier days when they were associated with Crown Coaches as their fleet history will testify, so I am pleased to be able to report that OAE954M has recently been renovated and returned to service in latest fleet livery of cream with maroon skirt and rear end. 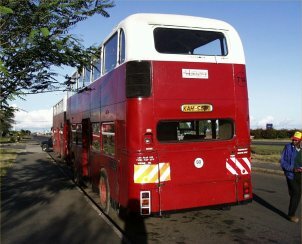 It is being operated in revenue-earning service over the Christmas break, when double deckers are not required for certain journeys. 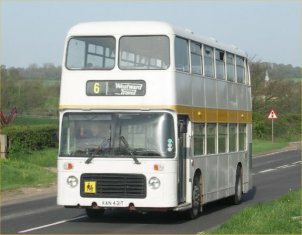 There is no better sounding bus than a RELL with a Leyland O680 livery so do take the opportunity to ride this one through the Somerset countryside if you possibly can. 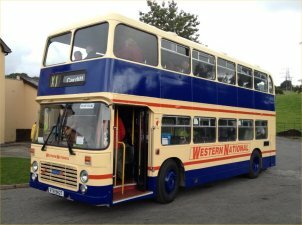 Carl Berry kindly sent me this photo of XAN431T which has recently received the current fleet livery of Westward Travel of Bristol. 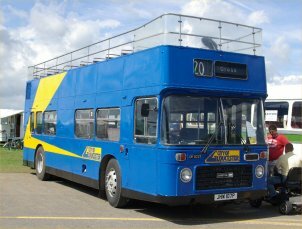 This is one of seven VRs delivered new to the Atomic Energy Research Establishment at Harwell in Oxfordshire of which five are still very much alive and well and still running in service around Britain. 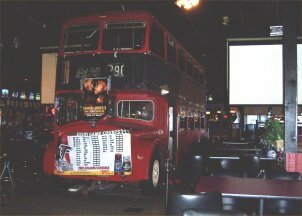 I would be really grateful if anyone has any scans of these with AERE that they could send to me at rob@robsly.com as such views are extremely hard to come by and have so far completely eluded me. 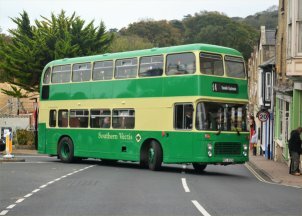 Rob Ryder of Summercourt Travel in Newquay has been a regular contributor to the website during the time he has operated VRs. 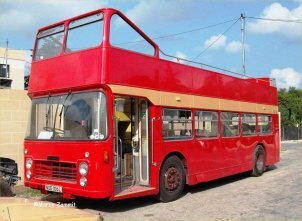 Recently UWV617S has been disposed of to a non-PCV owner, but UWV613S is to be retained and Rob has sourced a new roof for it after the original was lost somewhere between Sussex and Fife ownership, making it convertible open-top again. 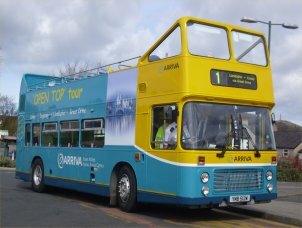 Presentation of the VR is excellent, as is that of the Street Safe exhibition unit XHK220X which is also maintained by Summercourt, although it is actually operated by a consortium of local police, ambulance and council. 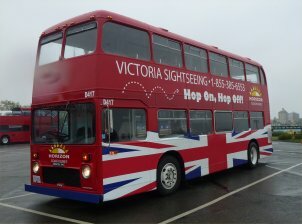 It is to be hoped that VRs will continue to ply the streets of Newquay for many more summers. 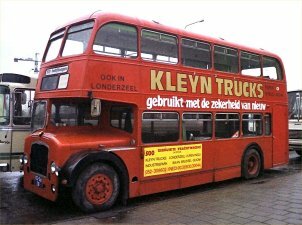 I don't often feature types other than VRs in here, but the news of a fifty-year-old Lodekka turning up in Denmark nearly thirty years after it was exported is surely worthy of celebration. 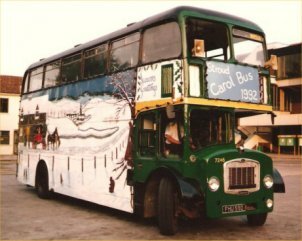 The bus in question is former Western SMT B1168 (GCS254) and it was spotted and captured on camera by John Blakey (now there's a good name for a busman) in North Jutland on November 29th in use in connection with a Christmas fair. 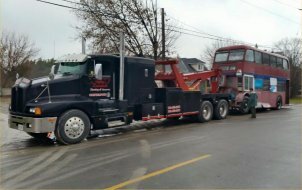 It appears to be owned by Connex Denmark, but that is unclear at this point. 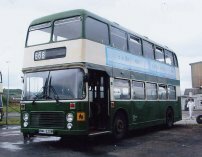 B1168 was quite a survivor even in 1975, having given a full twenty years of service to its original owner - a very rare event at the time. 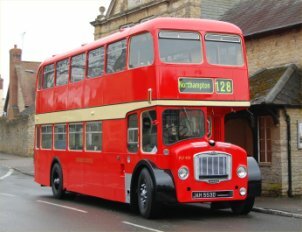 Interesting to note it was exported by none other than a fledgling Ensign organisation (then based in Benfleet) - one of the first of a very long line of half cabs to journey from Essex to the many far-flung corners of the World!! 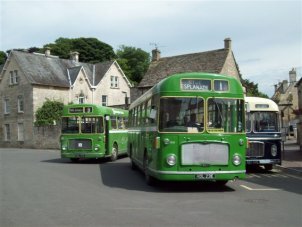 Bristol VRs can still be seen operating in everyday service at both ends of Great Britain - the Cornish operations of First are well documented, but Highland Country also run services in the northern-most towns of Scotland, including right the way up to John O'Groats. 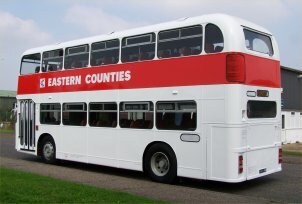 Former Eastern Counties KVF246V is seen here in Thurso, on the service to Wick. 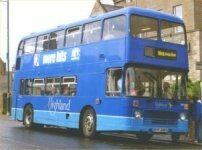 It is rumoured that Highland may be about to sell out to Stagecoach, with whom surely the VRs will not survive long - so take the chance to sample these remote services while you still can. 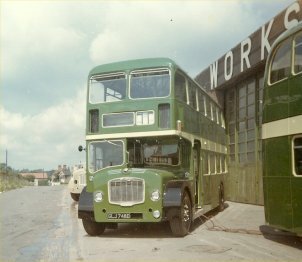 This month's study is an interesting view from Neil Halliday depicted the three VRs of the West Yorkshire Road Car Company Limited Preservation Group. 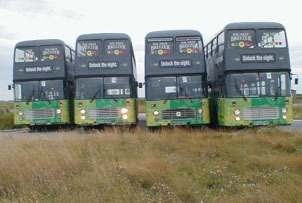 The Group now has one of each VR series, all of which were new to the West Yorkshire company. 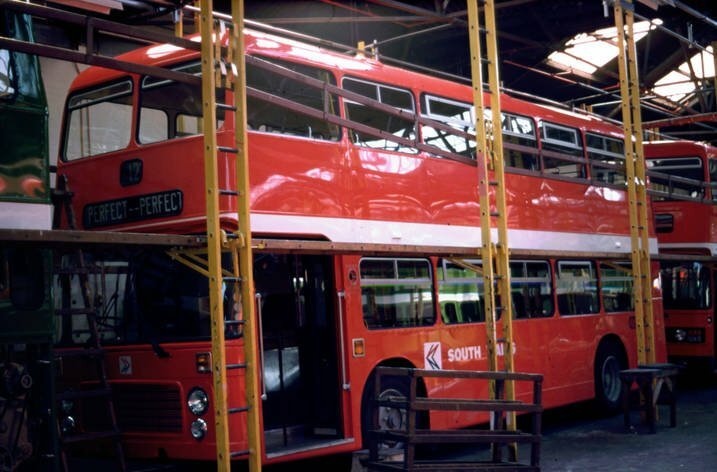 Closest to the camera is Series 1 VR4 (XWW474G) which has been in preservation for twenty years now and might - one day - receive a repaint out of its NBC red livery as carried while still in service with the company. 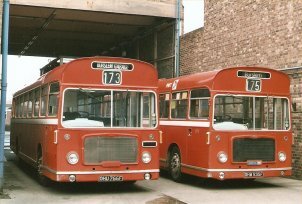 In the middle is Series 2 (curved windscreen) 1968 (JWW227N) which has had a partial repaint back into NBC red from its Grayscroft of Mablethorpe livery. 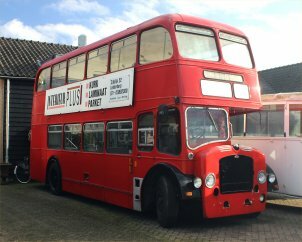 Furthest away is newest recruit, 1746 (PUM149W) which was recently acquired from a member at Keighley Bus Museum. 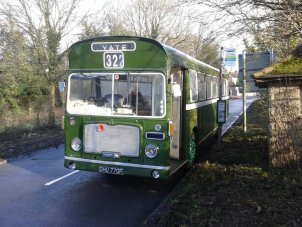 More can be learned about these preserved VRs by following the links from their registration numbers in this text. 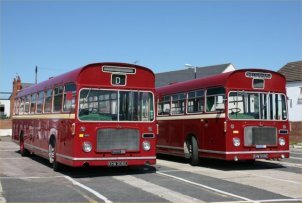 This month's pair of photos are an exclusive, courtesy of Richard Waterhouse who has just completed this impressive and extensive restoration of Midland General 801 (LRA801P) back to its original condition (although I assume it still carries a Gardner engine having been repowered by Trent from its original Leyland O501?). 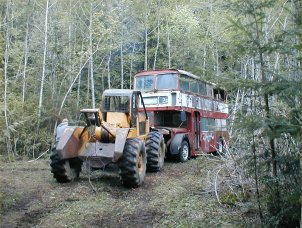 We see 801 on its maiden journey in suitable rural surroundings, the rear view showing the original flaps for the powerful vacuum cleaner that was used to clean out the upper deck from the outside. 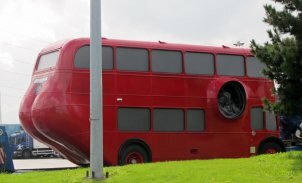 The idea was that the inlet blew air in whilst the outlet sucked any loose items out. 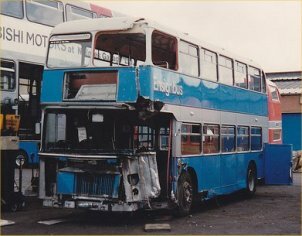 However, I believe the system was less than successful, with most of the dirt and rubbish simply being blown to the front of the deck where it had to be manually collected. 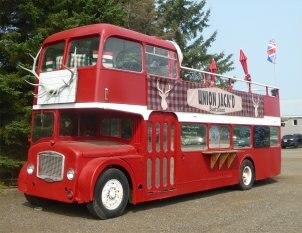 Many congratulations are due to Richard and thanks for the photos. 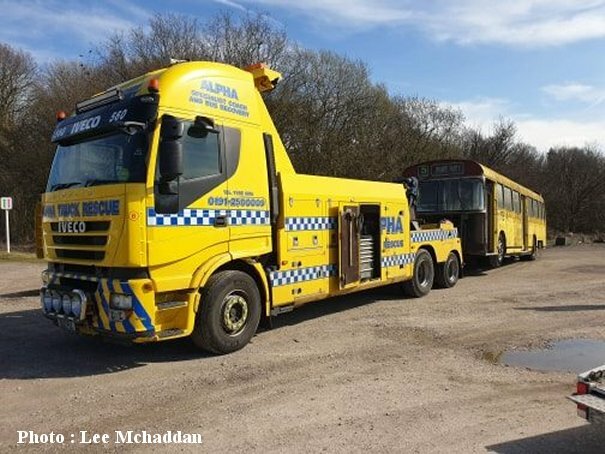 Ian Wilson took this view of Alpine's former Crosville Wales DVG520 (BMA520W) this very afternoon while it dries after a repaint into their new yellow school bus livery. 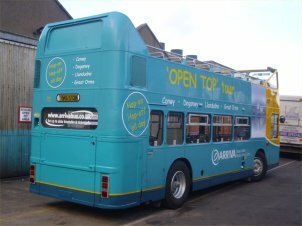 Ian understands that this one was chosen because it has been fitted with CCTV equipment and Alpine wanted to see what a VR looked like in this livery. 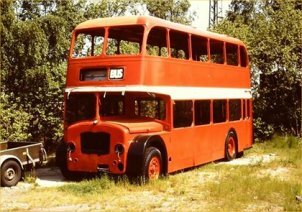 If considered a success it is likely that others will receive the same treatment. 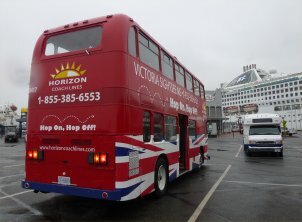 It's always great to see VRs receiving new colours for further service and this is no exception. 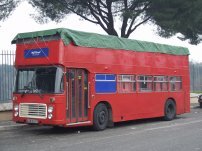 Former Alder Valley driver Hans Retallick was most surprised to come across former Alder Valley VR 969 (WJM829T) during a recent trip to Rome. 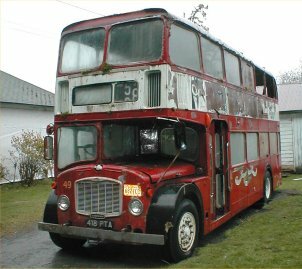 It has been converted to open-top for an unknown use, presumably some for of exhibition work, and was exported back in 1999 after withdrawal from Aldershot by Stagecoach Hants & Surrey (the spiritual successor to Alder Valley). 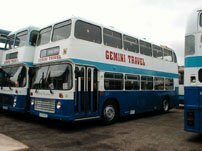 It is very pleasing to note that VRs continue to operate in Solent Blue Line colours into 2003, despite SBL having sold their last examples at the end of 2001. 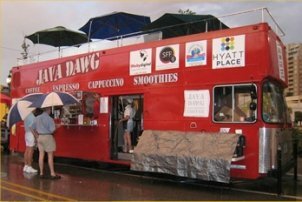 This can happen of course through the use of franchise operators to run some of their services. 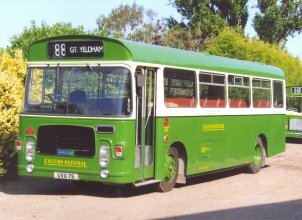 One such operator is Bri-Jan Coaches of Bishop Waltham who run three VRs including one-time Bristol Omnibus C5104 (PHY698S). 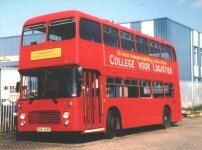 You will find further details of this opereator by following the above link because I have recently been extending the scope of the website to include ALL operators of VRs, not just those with four or more examples in service. 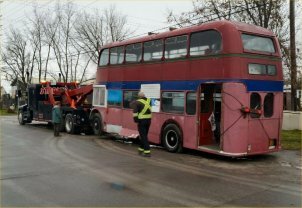 This work will be completed in the next few weeks. 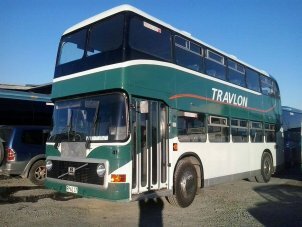 C5104 was sold by BOC in 1993 to be replaced by Volvo Olympians. 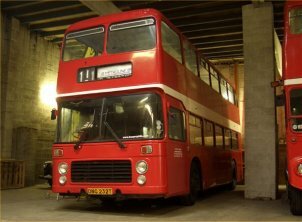 It continued to operate in Bristol though, neatly converted to single door (as seen here) by Bob Buglar. 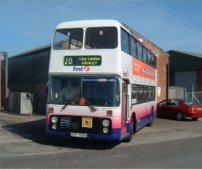 It was exchanged in September 2001 for YDL673T which remains in Bristol, and found its way into the Bri-Jan fleet in December of that year. 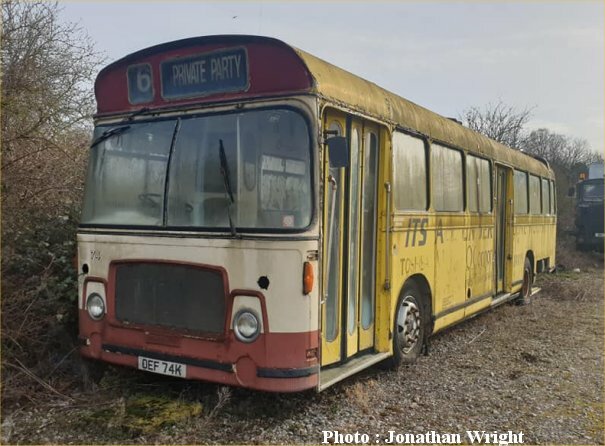 My sincere thanks are extended to Gerry Tormey for supplying this photo (see the amended link to his own Bristol SU site below) and to all the other kind contributors who help to keep this site as up-to-date as possible. 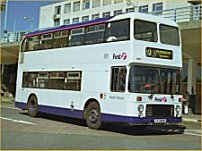 This month we depict another First "Barbie 2" liveried VR, but this time it is First Western National permanent trainer, 1259 (URF668S). 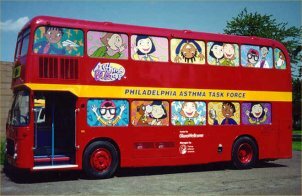 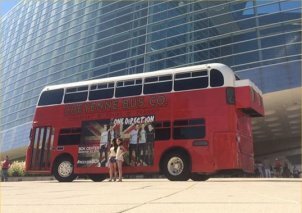 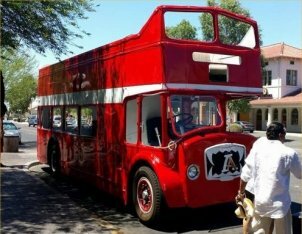 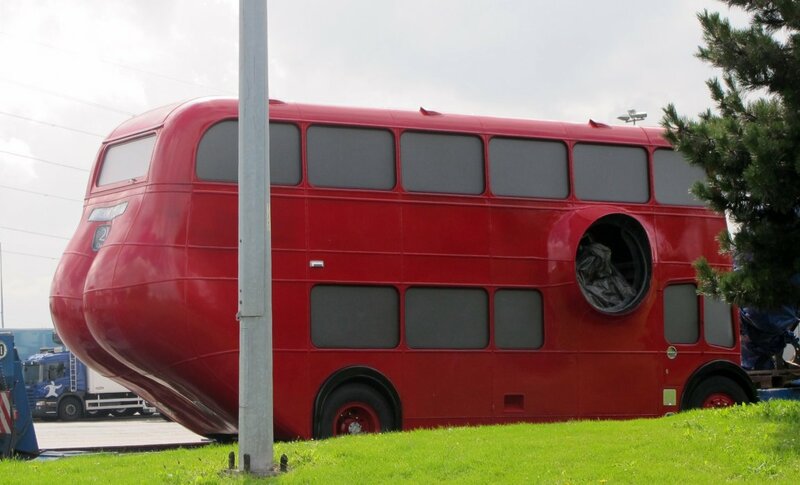 The lettering on the side reads "Your Bus Driving Career Starts Here". 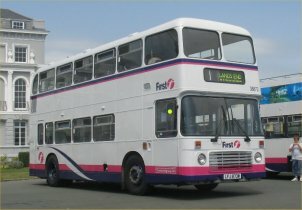 It is a shame that the pink fades have not been added to the livery to provide a splash of colour on what is an otherwise quite bland layout.1259 is an exceptional survivor, particularly when you consider that it started as an unusual ultra-lowheight Leyland O501-engined VR in the fleet of Potteries Motor Traction. 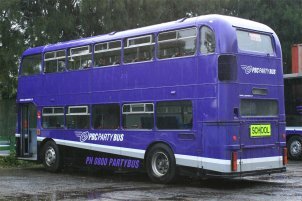 Although PMT later became part of Firstgroup, it was not by inter-company transfer that it found its way to the South West. 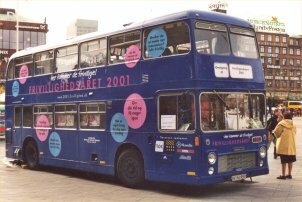 In 1992 it was sold to the independent Orange Bus Company in Bristol (later to become the Durbin operation) which was taken over by Bristol Omnibus in 1996. 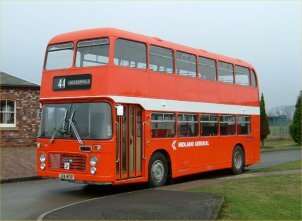 URF passed to Bristol in allover orange livery and its future was very uncertain, particularly when it passed to Western National for use for spares to keep the indigenous fleet going. 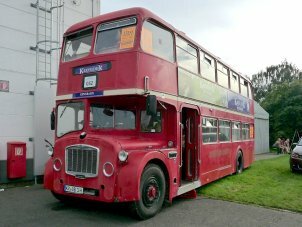 However it was in good condition, too good to break, and it was fitted with the Gardner 6LX engine from scrap WDM341R. 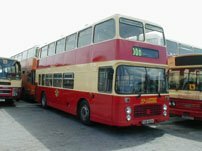 This engine was described as "gutless" by drivers around Plymouth and a 6LXB unit was substituted in 1997 and it remained in service in standard fleet livery until July 2002 when it received the livery shown above and settled into its new role. 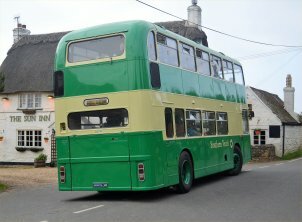 Many thanks to Richard Stedall for posting this picture which was taken last October. 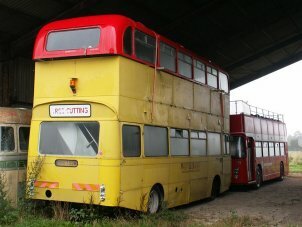 Ken Larking has kindly sent me this photo of a real survivor. 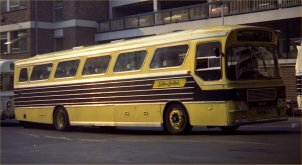 KOU796P was new to Bristol Omnibus as their fleetnumber 5510 and passed to Badgerline when that company was formed out of BOC in 1986. 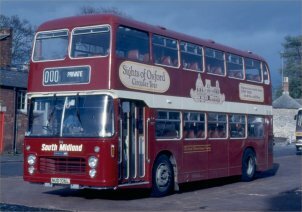 It passed to Western National as their 1085 in 1988 and was withdrawn in 1993, passing straight to the short-lived Nottingham Omnibus operation until it ceased in June 1994. 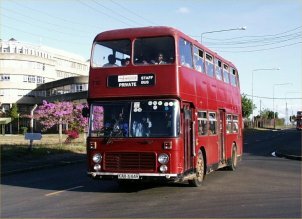 Next stop was Stephenson of Rochford in Essex before finally arriving with the associated M&E Coaches of Shoeburyness where it remains to this day running schools services in the Southend area. 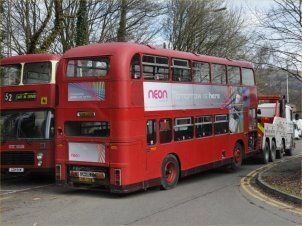 To the left can be seen FKM875V which is clearly still in Maidstone & District's final pre-Arriva livery. 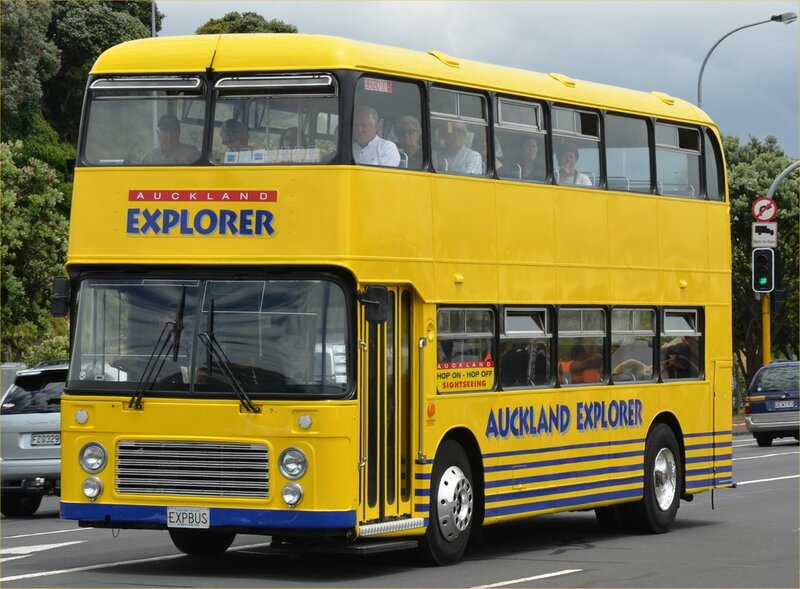 My sincere appreciation goes to Neville Tobin of Christchurch, New Zealand for posting this photo half way across the World for scanning for this feature. 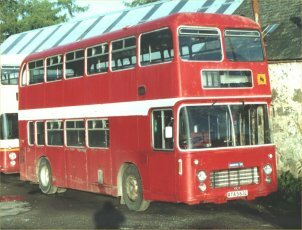 This VR was new to Crosville in 1978 as DVL368 (BTU368S), later re-engined with a Gardner unit and continued in service with Crosville Wales (as their DVG598) until 1996. It was exported to New Zealand in 1997 following a brief spell as a non-PCV in London and was used by Scenic Coachlines in Auckland repainted as an overall advert for Japan Travel Bureau. 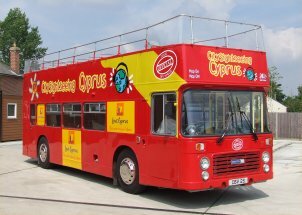 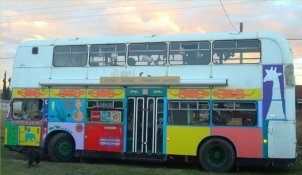 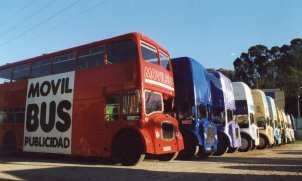 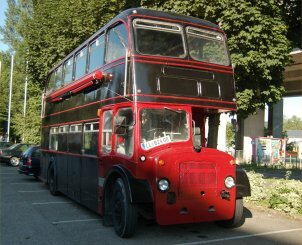 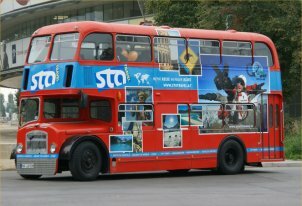 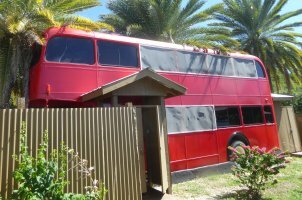 It is now with Redbus in Christchurch where Neville photographed it on sightseeing duties earlier in 2002. 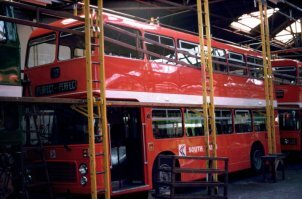 Redbus is the modern trading name for the former Christchurch Transport Board which of course took delivery of a great many Bristol RE single deckers and although all the REs have now been sold it is great to see that the traditional operation of Bristol vehicles in the city is being maintained. 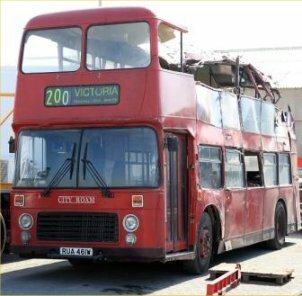 It is becoming increasingly difficult to keep track of the VRs that are being exported, both to the Continent of Europe and to North America. 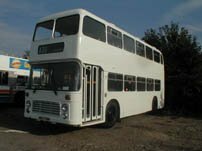 The job of tracing and identifying them is not aided by the number of reregistrations that take place before export, and this Series 3 example takes the biscuit in carrying the registration from a 1970 RE single decker (former Wilts & Dorset RLJ345H)! 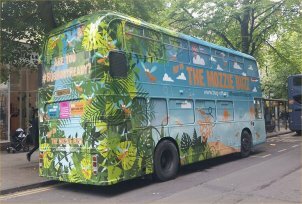 This as-yet unidentified VR is operating in Montreal, Canada in a livery that rather enigmatically promotes the Biosphere - presumably a local tourist attraction. 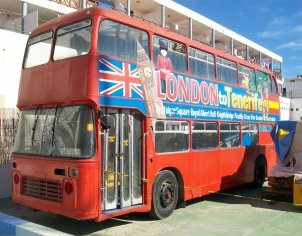 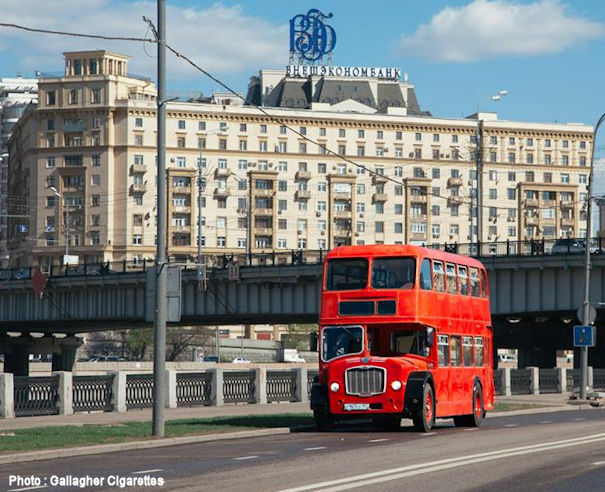 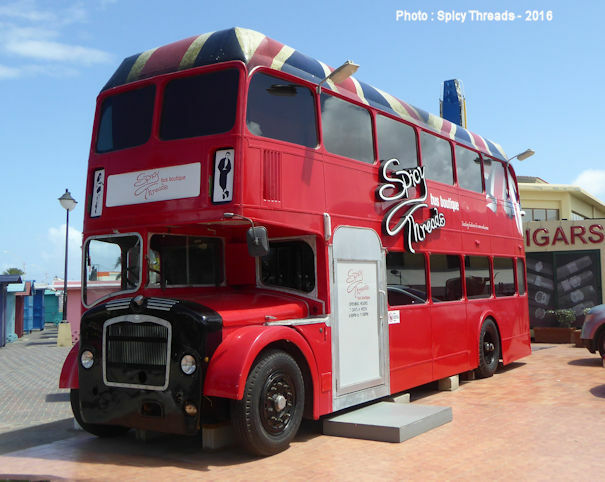 It was tracked down and photographed by my brother-in-law John Cleminson and his son Joseph during a recent trip - I am very pleased to have my Bristol double decker spies travelling all over the globe!! 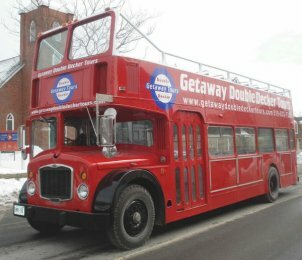 Updated October 15th 2009 : This VR is now in the U.S.A. with Philadelphia Trolley Works, numbered 340 and converted to open-top. 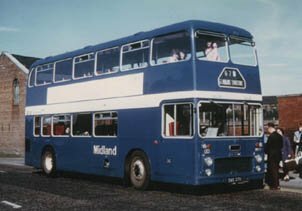 It has been identified as former East Midlands/Midland Red South AET181T. 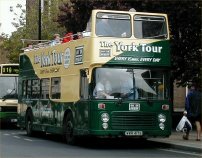 It had been thought that the operations of Viking Tours of York had finished in the summer of 2000 and that the company was in liquidation. 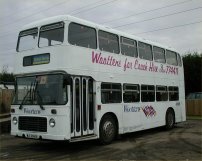 It therefore comes as something of a surprise that WTH962T has turned up back in service, repainted in a new livery but still sporting Viking signwriting on the rear as seen here. 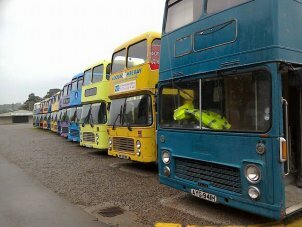 It would appear to be sponsored by Aston Villa Football Club judging by the choice of colours!! 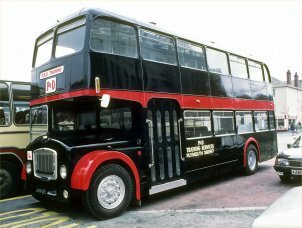 This VR was new to South Wales Transport as their 962 in 1979 and was sold to Battrick & Brown of Manchester in 1989. 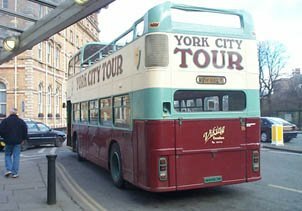 After two years it moved across to Viking in York whereupon it was converted to open-top and placed in service in May 1991, and it has been a regular sight ever since. 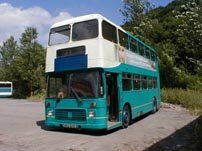 962 was delivered with a Leyland O501 engine like most South Wales VRs, and I have no record of it ever having lost this motor - can any local members confirm whether or not it has been re-engined with a Gardner please? 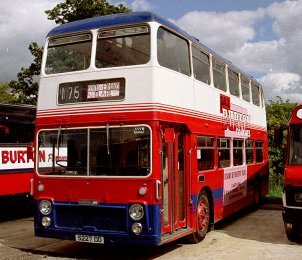 Many thanks to Adrian Brown for supplying the photo which was taken on March 12th 2001. 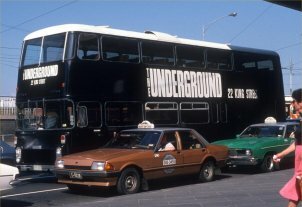 This week we go right back to the beginning for the VR. 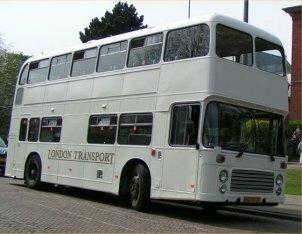 GGM431D was the very first to enter service, being one of the two VRX longitudinally-engined long-wheelbase prototypes. 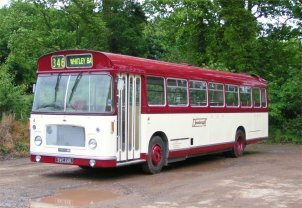 This vehicle was demonstrated at the 1966 Commercial Motor Show before travelling north of the border for an extended period with the Scottish Bus Group. 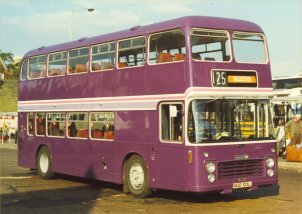 It is seen here soon after entry into service with Central SMT as their BN331 pounding the streets of Glasgow. 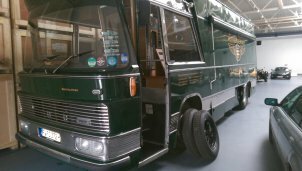 You can find a detailed history of this vehicle on the VRX-1 Illustrated History page. 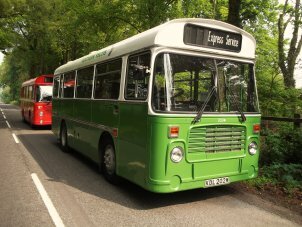 This photo was kindly supplied by Mark Telfer, although he bought it from an anonymous dealer at a rally so if it's your copyright please let me know and I'll happily add a credit for you. 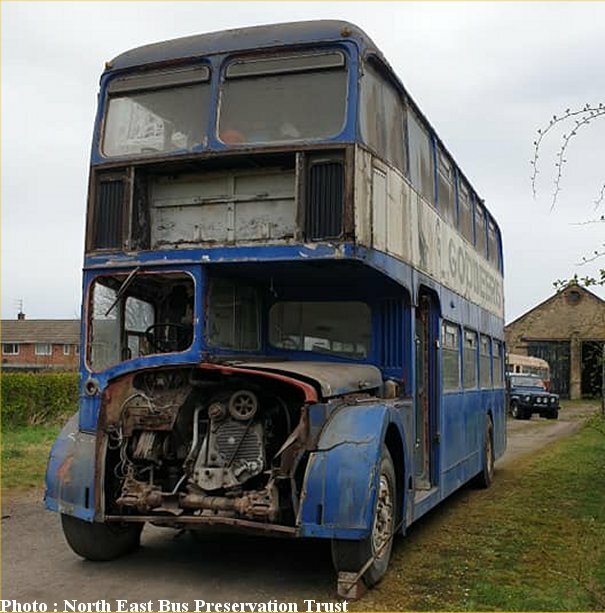 I make no apologies for posting this picture of recent ABus of Bristol acquisition MOU739R even though it has already appeared on the excellent ECWBristol egroup. 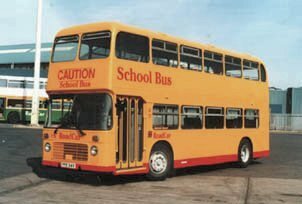 This bus holds fond personal memories for me of journeys to school across Cheltenham in the early 1980s and I am really pleased to see that it has found a good new home having only earlier this year retired from mainline service with Stagecoach Cheltenham & Gloucester. 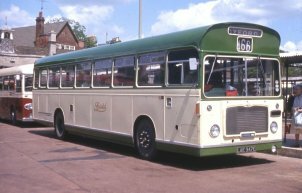 It was new to Bristol Omnibus in 1976 as G5065 (the G denoted being a member of the Gloucester City Services fleet) in NBC green livery and with dual doors. 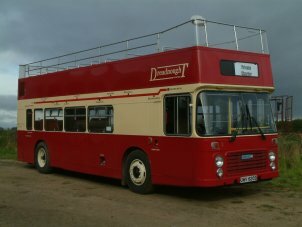 It was transferred in about 1981 to Cheltenham and duly received NBC red livery in 1984 after the split from BOC. 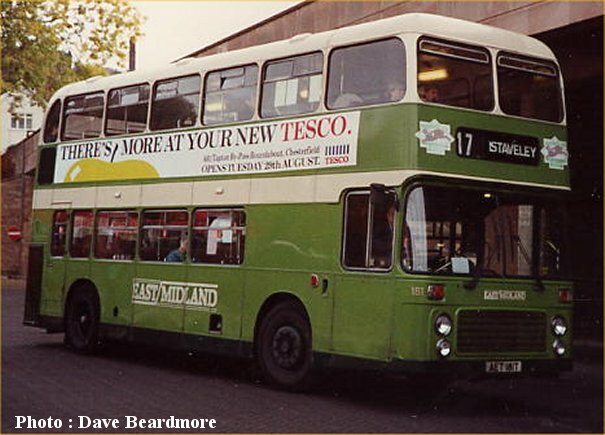 A spell in overall advertising livery for the Gloucestershire Echo was followed by a rebuild to single door layout in 1988. 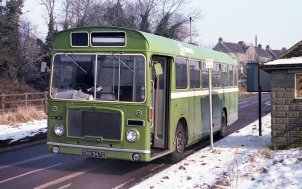 It was later transferred to Stroud Depot where, now renumbered 204, she received green and yellow "Starsky and Hutch" livery. 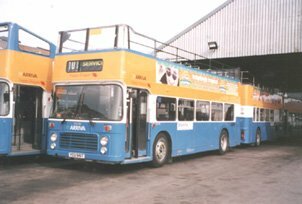 The final transfer was to Stagecoach Cirencester where allover aircraft blue was applied for contract work, although 204 was also often to be found on stage carriage services. 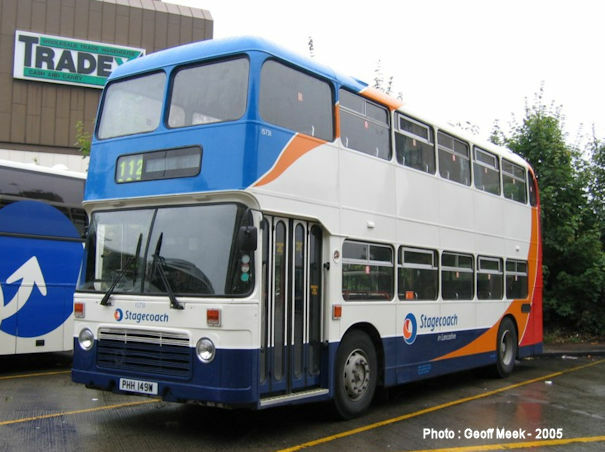 Hastily withdrawn early in 2000 under the new management regime which sees fit to cascade not much younger Limpalongs to the Stagecoach West fleets, 204 was sold along with most of her siblings to Simon Munden in Bristol. 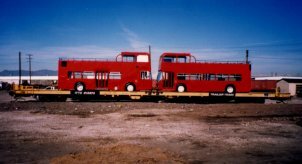 This view at the Munden/ABus yard at St Phillips was taken by John Hammond on September 11th, resplendent in a shiny new coat of white paint. 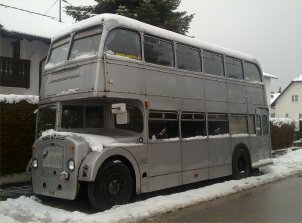 One wonders what the future holds for this excellent machine. 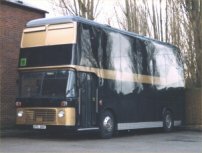 A real surprise is the repaint of one of Road Car's few remaining VRs into a new livery, especially considering how quickly the fleet has been disappearing over recent years. 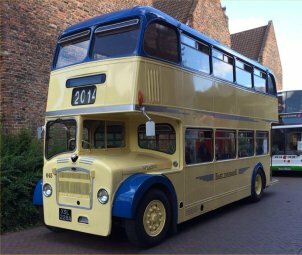 The livery is dedicated for school buses, following a recent national trend of US-style yellow school buses, and the first example into the scheme is 1957 (PFE541V) seen here on September 4th at the Road Car garage in Lincoln. 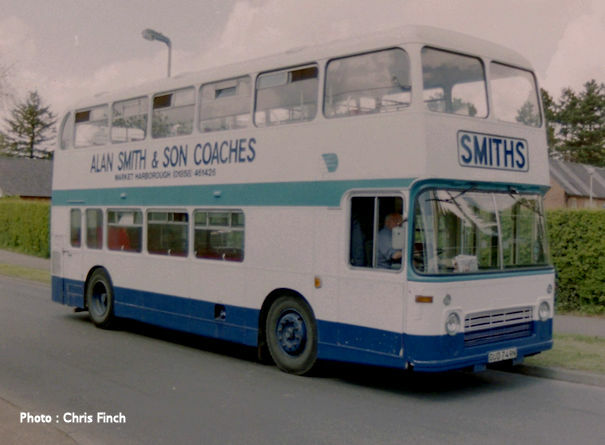 Many thanks go to Michael Hill for supplying this photo and also for the wealth of other interesting photos he has supplied from this region recently. 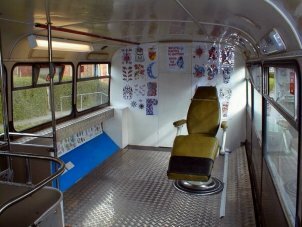 More of Michael's work will appear on this site soon.